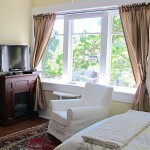 Victoria BC's deluxe heritage furnished suites. 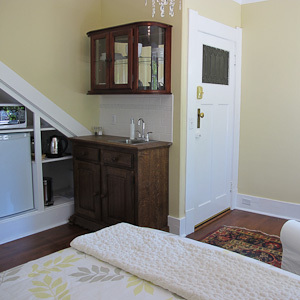 The Acorn Suite is a favourite with people looking for a cozy yet deluxe studio suite. This sunny suite features a unique and functional kitchenette, pretty chandelier, and plush bedding. 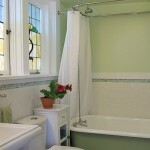 The ensuite bathroom has a wonderfully deep claw foot tub for a relaxing soak or bubble bath after a long day of work or play. 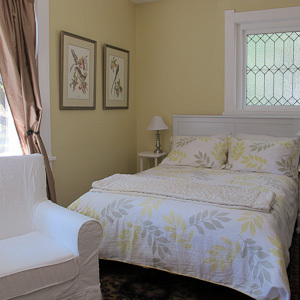 With lots of windows and natural light, the Acorn Suite is best suited for a single person, or for a couple renting this suite in conjunction with a larger suite at Oaklane. This suite offers the peace of mind and privacy of your own space, as well as a flat screen tv, and electric fireplace. And it’s as cute as a button!